Soft power washing has plenty of benefits in home improvement, restoring the house appearance and protecting your health. Mr. Wright’s soft power washing services ensure you will have not only a clean home but also a healthy environment to enjoy. 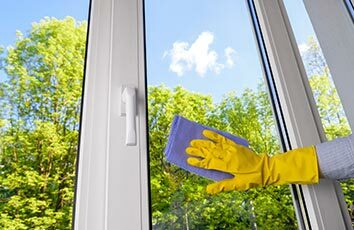 Power washing helps you get rid of all these pollutants and dirt sources before they penetrate the walls and damage the house’s looks and functionality. Your driveways and pathways also benefit from power washing, as rain, car traffic, foot traffic, and other factors can ruin them, making them dangerous, poorly looking and functioning. 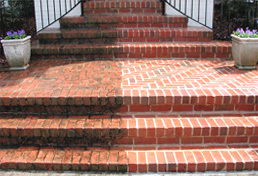 Power washing removes debris, mud, mold and mildew from these areas, making sidewalks, driveways, and garden pathways shine again. We use gentle mixes of detergents and tailored substances to remove all threats, rinsing and cleansing the surfaces until they look brand new. Power washing is also used in hard to reach areas that need a complete makeover or when you need to clean hard surfaces like concrete. Patios and decks can also benefit from a power washing service, as you need to remove dirt, grime, and debris from those narrow, hard to clean spaces in between bricks and stones. What Are the Main Benefits of Soft Power Washing? It Improves Curb Appeal: In case you want to sell or rent the house, a proper power washing session can restore a home’s former shine and glory. 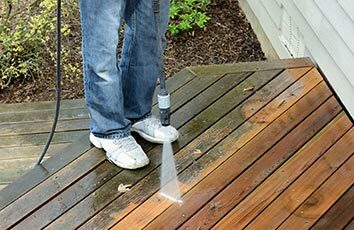 Mr. Wright’s soft power washing will remove mold, mildew, grime, dirt and grease from the house, fences, driveways, pathways and sidewalk. This will turn your house into a very attractive property that might compel a prospective buyer to make a more attractive offer. It Increases a Home’s Value: According to the National Association of Realtors, power washing is one of the most affordable means to increase your home value. In fact, it is estimated that a power washed property can raise the sale price by $10,000-$15,000. 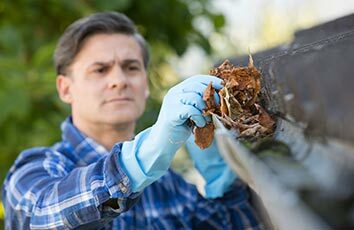 It Protects the Health of the Inhabitants: mold, mildew, dirt, insects, algae, fungi, animal waste, car exhaust and so on are all powerful contaminants threatening the health of you and your family. Many such contaminants cause allergies, asthma, and plenty of diseases; this is why regular power washing services can be considered preventative health measures. Washing off bacteria and removing the threat of slipping on dirty, greasy surfaces is the reasonable thing to do to keep your family safe. It Increases Your Home’s Life Span: Instead of letting the house get damaged and engage in home repairs that are time and money consuming, you can schedule regular power washing sessions to hinder decay, rot and premature aging of the house. Soft power washing has plenty of benefits, and Mr. Wright’s service is known to cover all these issues. Give us a call today, ask for a free estimate and let us turn your property into a picture-perfect corner of Paradise!